Another young boy as young as 16-year-old is said to have become victim of the vicious blue whale challenge. This boy, Karan Thakur, was a student of standard X of DAV Senior Secondary School in Sector 8, Chandigarh and lived in Panchkula’s Sector 4. On Saturday, he hung himself from the ceiling fan and killed himself. Bereaved parents could little make out the reason of his dastardly action before they found a notebook with drawings made by Karan that pointed victim was thinking about suicide. There were Blue Whale diagrams, depicting its ‘tasks’, drawn in the victim’s hand in his Maths notebook. Police was informed of these drawings on Monday. The police have taken the notebook and the boy’s phone for investigation. The drawings showed a boy jumping from a building, a boy hanging from ceiling fan, ending life on a railway track, standing in front of a car and slitting the wrist. Also, he had written the following sentences: I should just die; I don’t deserve to live; Nobody likes me; Nobody loves me; No one cares whether I live or die; They just use me. A WhatsApp display picture (DP) on the number of the victim stated: Don’t get to close..It’s dark inside. It’s where my demons hide…. The parents shared that Karan had himself asked to be given psychiatric help “as he was addicted to a game”. However, the parents ignored and regret now and said that those initial symptoms should have alerted them to the impending tragedy. Karan had also warned his cousin Rahul not to play the Blue Whale game. What alerted the family to probe blue whale challenge angle was the cut on his left wrist and the fact that he had asked for a psychiatrist. 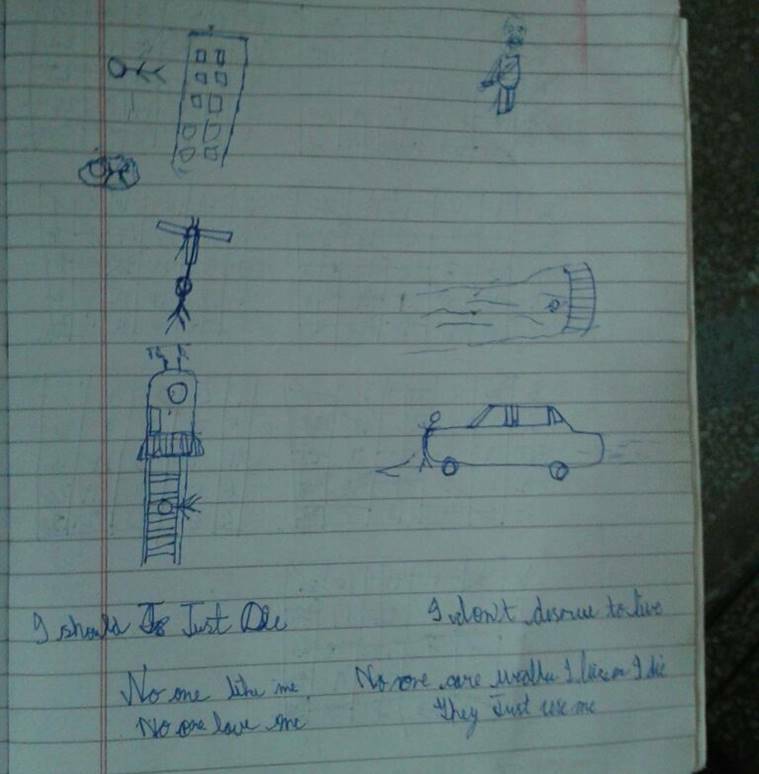 His uncle got suspicious and started searching his notebooks and found all these drawings on the last page of his maths notebook. ChandigarhX urges all parents, teachers and elders, please don’t ignore anyone who is depressed. He/she needs your help more than anything else. And please keep monitoring the activities of your child, online and offline too.